[George II orders the Treasury to pay the Army Paymaster half a million pounds in the same week as the Battle of Culloden.] Warrant, signed 'George R.'; with order signed by three Lords Commissioners: Lord Holland; Lord Lyttelton, Richard Arundell. 'Given at our Court at St. James's this 10th. day of April 1746 In the nineteenth Year of our Reign'. An interesting document, in which George II directs the Commissioners of the Treasury to pay over half a million pounds to the soon-to-be-deceased Paymaster General of the Forces, Thomas Winnington (1696-1746). This astronomical sum was required for the maintenance of the British Army not only in the War of the Austrian Succession, but also in the 1745 Jacobite Rising. The decisive Battle of Culloden would be fought six days after the date of the warrant, on 16 April 1746 (O.S.). The document is 1p, folio. [Henry Pelham, Prime Minister; Henry Fox, 1st Baron Holland; Richard Arundell.] The signatures of the three men ('H: Pelham | H Fox | R Arundell'), as Lords Commissioners of the Treasury, order to pay Thomas Winnington, Paymaster-General, £500,000. 1p, folio. In fair condition, lightly aged and worn, with thin strip from mount adhering to one edge. Folded twice. The three signatures are firmly and boldly written ('H: Pelham | H Fox | R Arundell') in the right-hand margin. The document read s: 'Order is taken this 18th. Day of April 1746 By Virtue of his Majestys General Letters of Privy Seal bearing date the 26th day of June 1727. And in pursuance of a Warrant under his Majesty's Royal Sign Manual dated the 10th. instant That you deliver and pay of such his Majestys Treasure as remains in your Charge unto Thomas Winnington Esqr. [Ancient Egypt; Leslie H. Fox (as 'Leon Rea' and 'Alan Quatermain').] Typescript, with autograph emendations, of 'The Forgotten Incarnation. A Novel of Romance', an unpublished work on the theme of reincarnation, set in Ancient Egypt and London. Apex Literary Agency, 293 Grays Inn Road, W.C.1. [London]. Fox's addresses: 30 Cedar Road, Cricklewood; 8 Avenue Mansions, Finchley Road. No date [circa 1943 or 1944]. + 222pp. With additional page carrying two figures to be inserted in the text (the first a 'Bezel', the second two cartouches). Each page on the recto of a separate leaf. Autograph emendations throughout, including additional text on reverse of one leaf. Housed in grey-card punch-hold binder. The typescript and leaf of illustrations are in good condition, on lightly aged thick paper, the three pages of prelims are on creased and worn thin paper; the binding is heavily worn. Typed label on cover (pasted over other labels) from 'Apex Literary Agency, 293 Grays Inn Road, W.C.1. [ 'Mrs. George Wrottesley' [ Margaret Anne Wrottesley ], journalist and daughter of Sir John Fox Burgoyne. ] Autograph Letter in the third person to 'Mr Lacy' [ theatrical bookseller Thomas Hailes Lacy ], regarding copies of two plays. Wrottesley, Wolverhampton. 10 February 1864. See Mrs George Wrottesley's obituary in The Times, 10 May 1883, in which she is praised for 'her undaunted courage and unshaken endurance of difficulties displayed repeatedly during her father's mission to the East' in 1854. 1p., 12mo. In fair condition, lightly aged. The main body of the letter reads: 'Mrs. George Wrottesley will feel much obliged to Mr Lacy if he will send her a copy of the play of | "The Wonder" - | The address is to | The Honble. | Mrs. George Wrottesley | Wrottesley | Wolverhampton'. At the head of the letter she adds a query concerning 'the play of Donna Diana'. [ Major-General Sir Henry James of the Royal Engineers, Director General of the Ordnance Survey. ] Autograph Letter Signed ('Henry James.') to Sir John Fox Burgoyne, regarding Sir Emerson Tennent and 'abstracts from Meteorological observations'. On letterhead of the Ordnance Map Office, Southampton. 20 November 1856. 3pp., 12mo. Bifolium. In good condition, lightly aged. Addressed to 'Sir John F. Burgoyne. | Bart:'. He is sending 'a copy of the Abstracts from Meteorological observations taken at our Foreign stations, in which Sir Emerson Tennent will find the abstract from the observations taken at Columbo in the year 1853-4'. He is also sending abstracts from subsequent years which 'have not yet been printed'. [ The New Asbestos Company, Limited, London. ] Prospectus with application form, accompanied by reports by Sir Douglas Fox, T. J. Scoones and C. Lacoste. The three items in fair condition, lightly aged and worn, with light damp staining to the Prospectus. ONE: Prospectus. 4pp., tall 8vo. Bifolium. First page headed 'Contractors to the French Government, Naval, Military, and State Authorities. | The New Asbestos Company, Limited. | Incorporated under the Companies Act, 1862 to 1886, whereby the liability of each Shareholder is limited to his Shares. | Capital - - £120,000, | Divided into 30,000 Shares of £4 each. [ Henry Vassall-Fox, Lord Holland. ] Autograph Letter Signed ('Vll Holland.') to Rev. Matthew Marsh, Rector of Winterslow, including his own translations of his son Charles's Eton College Latin exercises, with his comments. 4pp., 4to. Bifolium. With frank carrying a Falmouth postmark and broken seal in black wax, addressed by Holland: 'Falmouth October twenty seven 1808 | Revd M Marsh | Winterslow | Salisbury | Holland'. [ Henry Fox, 1st Lord Holland. ] Autograph Signature ('H Fox'), with those of George Lyttelton ('G Lyttelton') and Richard Arundell ('R Arundell'). On 16 x 6.5 cm strip of paper, cut from financial document. In fair condition, lightly aged and worn. Addressed to 'Mr. Townshend' on one side, with signature of witness 'Jno. Lesingham', with the signatures of 'H Fox', 'R Arundell' and 'G Lyttelton' on the other, with date 27 May 1746, next to the word Orford, and below part of a sentence relating to 'Duty on Candles'. [ Harriet Willoughby, daughter of Whig politician Charles James Fox. ] Autograph Signature ('H Willougby') on part of letter. On 8 x 18 cm piece of paper cut from the end of a letter. In fair condition, lightly aged. Reads: 'And now my dear Mary Anne adieu With kind Regards to Mr T & love to yourself I remain ever | Your's sincerely & affectionately | H Willoughby | I shall leave directions With Mr Hyman to forward the Papers during my absence'. Green illustrated boards, blue endpapers (advertisements at back for publisher - hunt maps, wine, game and fisihing etc), not paginated, sp. and corners rubbed, hinge strain, but contents mainly good+. An attractive book. Runs from October to April, variable quantity of pages per month, details not filled in by would include (in orange) 'date', 'which hounds', 'met at', 'rode',' found at'. It concludes with blank pages headed "Hunters", "Hunting Expenses", and "Remarks". [Michael Angelo Taylor, Whig Member of Parliament.] 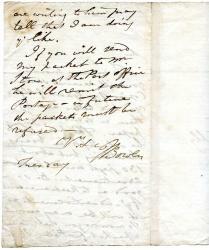 Autograph Letter Signed ('M A. Taylor') to an unnamed recipient, expressing pleasure at the fact that a prosecution under his own act has been dropped. 1p., 12mo. Very good, on lightly-aged paper. The letter reads: 'Sir | It gives me sincere Pleasure to learn that The Information against you was quashed. The Offence charged, does not come either within The Letter or The Spirit of my Act. I am only vexed that you have had so much Trouble.' Taylor's connection with the Metropolitan Paving Act of 1817, led to it being referred to as 'Michael Angelo Taylor's Act', but it is unclear which act he is referring to in this letter. [Arthur Henry Fox Strangeways, English musicologist.] Two Autograph Letters Signed (both 'A. H. Fox Strangeways') to an unnamed recipient, declining to print an article in 'Music and Letters', and providing information about the composer Rauzzini. Both on letterheads of 'Music and Letters', 38 Lansdowne Cresent, W11 [London]. 13 January and 3 February 1934. Both items in good condition, on lightly-aged paper. ONE (13 January 1934): 1p., landscape 12mo. The 'proposed article sounds the sort of thing', but Strangeways cannot accept it until he sees it. TWO (3 February 1934): 2pp., landscape 12mo. He thanks him for sending the article, regarding which he writes: 'if the musicians mentioned in it had been more important or there had been more about them, it wd. have been worth printing; but as it is I am afraid it is not of sufficient interest.' The writer's reference to 'Ranzini' is, Strangeways points out, 'almost certainly' a mistake for 'V. Autograph Note Signed ('Charles Fox')[ from the civil engineer and designer of the Crystal Palace] Sir Charles Fox to Edward Walford, regarding the proof of his entry in biograpahical dictionary. On letterhead of 8 New Street, Spring Gardens, London. 15 May 1867. 1p., 12mo. Good, on lightly-aged paper, with minor traces of glue from mount on blank reverse. He informs Walford that he is returning 'the notes of my career having made some slight alterations'. He suggests that it would be 'well for me to compare the proof with the drafts'. [Berkhamstead] The photographs dating from c. 1855 to 1876. Sybil M. Hubert's ownership inscription dated 1883. 49 photographic prints, laid down on 48pp. of a small (16.5 x 13 cm) contemporary 4to album, quarter-bound with brown leather spine and brown cloth boards, with yellow endpapers. No captions: the only manuscript in the volume being the ownership inscription of 'Sybil M. Hubert | 1883' on the front free endpaper. A fragile survival: aged and discoloured, with occasional staining from damp, which also caused some of the photographs to stick to one another, with slight damage occurring on their being detached; binding also in poor condition, with boards detached and leaves loose. Autograph Letter Signed ('John F. Dillon') from Sir John Fox Dillon of Lismullen to 'My dear Mary', criticising the 'queer state' of Irish politics, First World War 'shirkers', and describing what he claims as the first tractor in Ireland. On letterhead of Lismullen, Navan, County Meath [Ireland; Eire]. 20 December 1917. 4pp., 12mo. Bifolium. 61 lines, closely written in a crabbed, difficult hand. Good, on lightly-aged paper. He begins by thanking her for a book, before commenting: 'Things are in such a queer state in this country that it is hard to know what will happen. This Government is enough to drive one mad. They are afraid to do a thing until the Convention has come to some sort of compromise (which no party will accept). The Sin [sic] Feins will do their best to upset any recommendation the Convention may come to. You must remember there are the Ulster men (Royalists) Royalists [sic] from all parts. Printed colour halftone handbill advertisement for the Illustrated London News by publisher by Thomas Fox, Strand, London, within illustrated floral border by Sulman. On one side of a piece of 27 x 19.5 cm. paper. In fair condition, on aged paper with wear to margins. Printed in red, green, yellow, brown and black. The text is crisply printed in red and black, with an engraving of the London skyline around St Paul's beneath the magazine's title. The text begins: 'This journal contains engravings of all the leading events of public interest, from original sketches and photographs.' Subscription details are followed by a short section on 'The Illustrated Sporting and Dramatic News'. 2pp., 12mo. Unpaginated. On laid paper. In fair condition: lightly-aged and creased. The deposition begins: 'JOHN Davies, Servant to Thomas Bonnell, Gent. maketh Oath that on or about the 15th Day of June last Mr. Ford, of Coleman-street-Buildings, who is employed as Attorney or Sollictor [sic] for the Right Hon. Henry Fox, Esq; against the said Thomas Bonell, [sic] gave to this Deponent half a Guinea, and promised him, in case he would bring any Books, Letters or Papers of his said Master's, that Mr. Fox would pay him, and make him an honorable Recompence for so doing. Printed, in a variety of types and point sizes, on one side of a piece of landscape 8vo paper. Text clear and complete. On aged and creased paper, which has been laid down on a backing of pink card. In full reads 'FOXES. 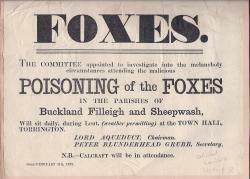 THE COMMITTEE appointed to investigate into the melancholy circumstances attending the malicious POISONING of the FOXES IN THE PARISHES OF Buckland Filleigh and Sheepwash, Will sit daily, during Lent, (weather permitting) at the TOWN HALL, TORRINGTON. | LORD AQUEDUCT, Chairman. | PETER BLUNDERHEAD GRUBB, Secretary. | N.B. 4to, 6 pp, with a seventh leaf carrying the title 'The Ludlow Hunt Alphabet. An Adaptation.' (The title at the head of the poem itself is 'The Ludlow Alphabet. An Adaptation.') A genuine typescript, and not a reproduction. A poem of 128 lines, divided into 32 4-line stanzas. Fair, on aged paper, with the last leaf laid down on a leaf of an autograph album, with traces of a newspaper cutting on the reverse. Consisting of playful references to members of the Hunt, arranged alphabetically. First stanza: 'A's for Allcroft, on chestnut | With frontlet of blue. [Printed handbill libretto.] The House that Jack built. A Nursery Cantata. 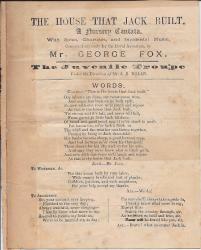 With Solos, Choruses, and Incidental Music, Composed expressly for the Royal Aquarium, by Mr. George Fox. The Juvenile Troupe, Under the Direction of Mr. J. E. Nolan. [Circa 1880.] 'The Music Published by Messrs Hutchins & Romer, Conduit Street, Regent Street'. Small 4to, 4 pp. Bifolium. Text clear and complete. Fair, on browned high-acidity paper. Neat strip of stub from mounting in album still adhering to inner margin of verso of second leaf. Headed 'Words.' All but first chorus in double-column. A mixture of the original 'House that Jack built' with 'Jack and Jill'. Begins with 'Chorus. - "This is the house that Jack built. "', the first lines of which are 'Our labours are done, our recompense won, | And anger has been on no back spilt, | So now with one voice we'll laugh and rejoice | As this is the house that Jack built.' Characters are: Mr.
Autograph Signature of Samuel Rogers ['Saml Rogers'], 'the Banker Poet', on cheque drawn on his own bank, Messrs Rogers, Olding, Sharpe & Co.
30 July 1849. Messrs Rogers, Olding, Sharpe & Co, 29 Clements Lane, Lombard Street. Around the size of a modern cheque. Fair, on lightly-aged paper. A nice item, considering Rogers' background. A printed cheque for £40 cash, written out to himself (as 'S R'). With a lattice of five lines over Rogers' signature ('Saml Rogers') indicating payment. Denominations to be paid indicated on back. Signature ('J. F. Burgoyne | Lt Genl.') on part of letter to Stratford Canning. On the lower part of a letter, cut to form a rectangle, 11.5 x 18 cm. In good condition, with traces of stub from mounting along one edge, and a thin strip of paper, with Burgoyne's name in manuscript neatly laid down beneath the signature. 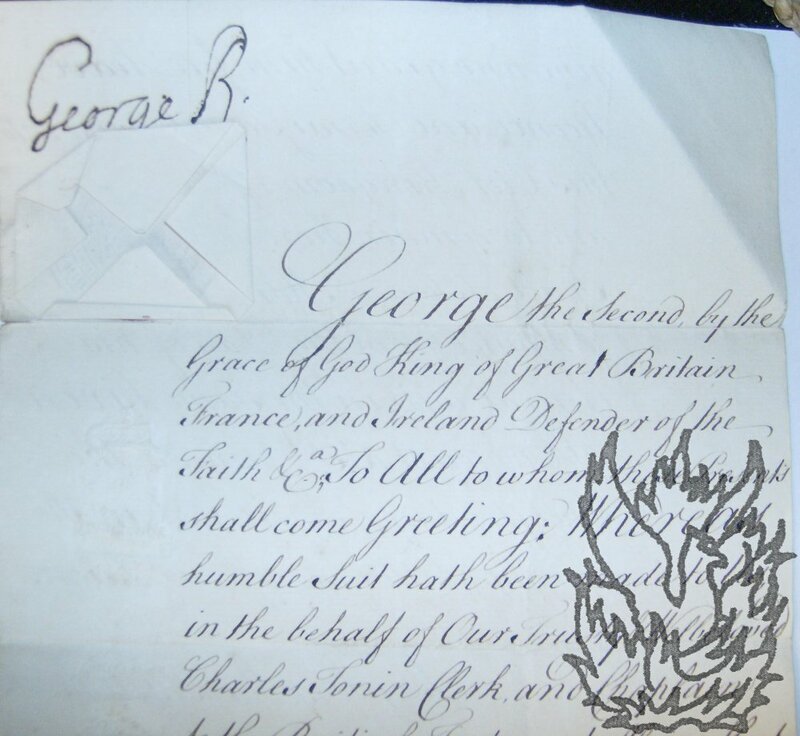 Reads 'I have the honor to be | Your Excellency's | Most Obedient | Humble Servant | [signed] J. F.
Manuscript Leave or Licence of Absence ('Leave to come to Great Britain'), signed by King George II ('George R.'), and by Henry Fox ('H Fox'). 12 April 1756; 'Given at Our Court at St: James's'. 2 pp, on the first leaf of a bifolium of gilt-edged watermarked laid paper. Leaf dimensions 30 x 19 cm. Text clear and entire. On lightly aged, worn and creased paper. The king's signature is in the top left-hand corner of the first page, above the royal seal, which is embossed on a folded square of paper over red wax. The seal covers the downstroke from the 'g' of 'George' and the final stroke of the 'R' in the royal signature. The document carries three blind-stamped 2s 6d tax stamps in the left-hand margin of the first page. Autograph Letter Signed ('Verney') to Rev. Charles William Tonyn (d.1805) of Radnage, Bucks. 12 April 1784; Curzon Street, London. 8vo: 1 p. 7 lines of text. Good, on lightly aged and creased paper, with the address on the reverse of the second leaf of the bifolium, to which Verney's red wax seal adheres. A graceful letter of thanks. 'It gives me no small satisfaction to think that my general Conduct has hitherto merited your approbation.' Informs Tonyn of the date of the general election. Verney would lose his seat, and with it his immunity from prosecution for debt, forcing him to flee to France. Autograph Letter Signed, with two postmarks, to John Mounsey of Sunderland. Kirkwall; date indecipherable, but docketed in pencil '1814'. Scottish historian (1762-1818), friend of Charles James Fox and Sir Walter Scott. 1 page, 8vo. Bifoliate, in very good condition, addressed on reverse of second leaf to 'Mr. John Mounsey | Furrier | Sunderland'. Difficult handwriting. 'Dear Sir. | <?> the beginning of March I sent to Lowth, by Mr Sir Joseph Banks, to be forwarded to you at Sunderland, Two matts or packages of Rabbit skins, containing 2127 Skins. Autograph Letter Signed ('J Bowles') to 'Mr Wright | Piccadilly', confirming his authorship of the 'Letters of the Ghost of Alfred'. Tuesday' [no date, but circa 1798]. Place not stated. 12mo, 2 pp. Bifolium with address on second leaf. Twenty-five lines. Text clear and complete. On aged, spotted and repaired paper. A significant letter, confirming Bowles's hitherto-tentative authorship of the 'Letters of the Ghost of Alfred', which was printed by Wright in 1798. Bowles informs Wright that he will 'receive some Copies of ye. Ghost of Alfred' the following morning. 'The price [I conceive] should be only 2/6 in boards there being but about 130 pages including thhe advertisements'. Autograph Note Signed ('M. E. Kennard') to unnamed male correspondent. Undated. 'The Barn | Mkt Harboro' [Market Harborough]'. One page. On piece of paper four inches by three and a half wide. Good, on lightly creased and aged paper. Docketed in pencil at head. 'Dear Sir | I have pleasure in enclosing my autograph. | Yrs. truly | M. E. Kennard'. Scarce autograph of the woman described as 'Harborough's forgotten novelist' (J. D. Bennett, in 'The Harborough Historian', 2001). A short account of a late short administration. Small octavo. Ten leaves. Pages:  + 14 + 3 (last three pages being publishers' advertisements). Disbound and in poor condition: grubby, foxed and creased, with some staining to first and last leaves. Stab holes from original issue. An account of Grenville's Ministry of All the Talents, in imitation of an article with the same title written by Edmund Burke in 1766, attributed to Horner. Typed Note Signed to the Royal Society of Arts. 10 May 1966; on letterhead '12A, EATON SQUARE, | LONDON, S.W.1'. Architect, town planner and foxhunter (born 1902). One page, quarto. Very good, with staple holes to top left-hand corner. Docketed in pencil. He has 'just returned from a trip in Egypt, conducted by Leonard Cotterell'. 'It occurred to me that it would be a good idea for him to give a lecture at the Royal Society'. Printed bank instructions, with autograph additions and signature. Dimensions: 5 inches by 7 inches. Somewhat grubby and with ink stain at foot. Headed 'THE MASTERS OF FOX HOUNDS ASSOCIATION, | TATTERSALLS, ALBERT GATE, LONDON.' Standing order to Dalkeith's bank, Coutts & Co of 59 Strand, to make an annual payment on 1 May to the Herries Farquhar branch of Lloyds one pound, as his subscription to the association. Signed 'Dalkeith'. Docketed by the bank and pinned to a 'Tattersalls' letterhead, roughly 5 inches by 7 inches, carrying a note which reads 'With the Secretary of the M. F. H. A's compliments.